What Does a Society Based on Faith and Charity Look Like? What Does a Society Based on Faith and Charity Look Like? Historian Dr. Andrew Willard Jones has managed to write a fascinating new book about medieval Christendom that discusses the amazing social relationships that brought individuals and families together as a people. This perspective is well presented in a brilliant defense of Christendom titled, Before Church and State: A Study of Social Order in the Sacramental Kingdom of St. Louis IX. One of the most interesting concepts in the book is that of Consilium et auxilium (Counsel and aid). This mutually beneficial relationship based on faith and charity created vast non-bureaucratic networks that assisted people at all levels of society. In contrast to the contractual relationships that dominate modern society, this manner of working together offers unique solutions and insights for the present. 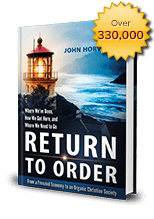 To discuss this relationship and how it might apply today, Return to Order author John Horvat interviewed Dr. Andrew Jones focusing on the idea of counsel and aid. In your book, Before Church and State, I was very impressed by your treatment of a medieval concept known as Consilium et auxilium (Counsel and aid). The focus of this interview will be on this concept. Could you briefly explain what it meant and how widespread it was? One rendered counsel and aid to another when one man made the other’s interests his own and deployed his resources in their service. Fundamentally it was the uniting of minds and actions, of intellect and will. Consilium et auxilium can be found all over the place in the primary sources of the times. It was prominent in the feudal oath that vassals swore to their lords. However, it was not simply a juridical or feudal formality. Rather, it was the content of real friendship—unity in Faith and Charity—and friendship was the ideal of social cooperation. This is in stark contrast to the order of our own society, which is based rather on contract. Could you provide a few examples of how this relationship was practiced in society? When a pope sent a legate into a kingdom, he almost always first sent letters to the monarch, the chief nobles, and the bishops and abbots exhorting them to render consilium et auxilium to the legate. The pope, of course, did not have a bureaucratic governmental structure and so his governance of the church in any given location was completely dependent upon the cooperation of the local powers. When they gave his legates consilium et auxilium, the pope had social power. When they did not, he did not. Similarly, the kings lacked bureaucratic government. They ruled through networks of friends, united in consilium et auxilium. Such networks were capable of marshalling massive resources in pursuit of large scale objectives, but without centralized control or sovereignty, in the modern sense. States, then, in the modern sense did not exist and did not need to exist. Why was the Consilium (counsel) aspect of this relationship so important? Take the example of a king with his nobles. The king sought the consilium of his nobles not only because he wanted to know what they thought, but because in rendering him consilium, they bound themselves to his endeavor as a friend. It was about uniting their minds. The king listened to them and got their “buy in,” we might say. Even if they disagreed with his decision, having given consilium, they bound themselves to cooperate. They were bound, unless, of course, their conscience forbade them from doing so. This is why the giving of consilium to the monarch was not just a right of the noble to be heard, it was a right of the king to listen. The king would sometimes insist that a particular noble came and gave him consilium, and particular nobles sometimes resisted doing so. To ask for consilium was to ask if someone was your friend. Refusing to give the king consilium was a bold thing that sometimes happened, but not lightly. From what I gather these were relationships based on honor. They could be offered and rescinded as needed. They could be permanent or temporary. Could you comment on this fluid organic aspect of this relationship? 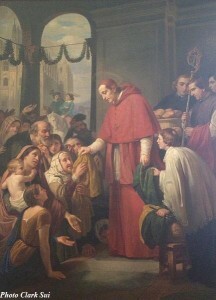 Networks of consilium et auxilium were ultimately based on faith in charity. Networks worked together in pursuit of some initiative because the members of the network believed it was the right thing to do and gave of themselves to each other in pursuit of it. Thus, if an initiative was completed, or changed course, or was diverted to serve some ulterior purpose, the network that pursued it could lose its cohesion. It could merge with some other network, dissolve or morph into some other grouping. One was not obligated to give consilium et auxilium in pursuit of unjust objectives. Thus, rendering consilium et auxilium to the right people in the right circumstances was part of what it meant to be orthodox. Rendering it to the wrong people in the wrong circumstances was part of what it meant to be heretical, or at least sinful. Because neither the king nor the Church ruled through bureaucratic governments, but rather society was governed through these networks, this adds a certain democratic element to medieval governance. However, this democratic element always looked to Divine Law for its legitimacy and standard of judgment. Our modern world is based on contractual agreements between parties. This favors a commercial relationship. Consilium et auxilium is more like a moral and family-like relationship. Could you comment on how something like this might be helpful in resolving some of our problems today? What consilium et auxilium allows us to imagine is social organization that is not based on contracts for mutual gain, be they commercial contracts or “social contracts.” I think if we reflect on our lives, we will see that we actually have many relationships with people that are not contractual, such as our family relationships. The reality of these relationships undermines the lie of the modern positing of the contract as the only form of social cooperation. It simply isn’t true. So, why not try to view more and more of the people with whom we interact in a manner similar to how we view our families? If we did this, we could start to see our way through the current order and toward something more humane. The Church is very much oriented toward this type of relationship. Could you comment on this? Like I mentioned earlier, ultimately networks of consilium et auxilium are networks of friends who are united in faith and charity. But, the unity of men in faith and charity is another name for the Church. The Church can be seen, I think, in the ideal as a single network of such friends that would, by rights, include all of humanity. What is more, faith and charity are infused theological virtues that are only truly possible because of supernatural grace, which flows to humanity through the Sacraments. What the medievals were doing, then, was envisioning all human society as ultimately ecclesial and as ultimately directed toward the ecclesial telos of humanity as a whole. Thank you very much for sharing these insights with us. This entry was posted in Featured and tagged Christian civilization, Christian principles, counsel and aid, Dr. Andrew W. Jones, faith and charity, honor, Institutions, leadership, Nobility of purpose, organic Christian society, Return to Order, tradition, Trust by John Horvat II. Bookmark the permalink.